Nearby Minds uses the Physical Web to give users the information they want and businesses the tools they need to understand their customers. Their solution has been deployed at the massive Donauinselfest in Austria and the CeBIT computer expo. When a huge festival of 11 stages, 16 islands, and more than 300 sales stands needed to be connected, there were only so many options. 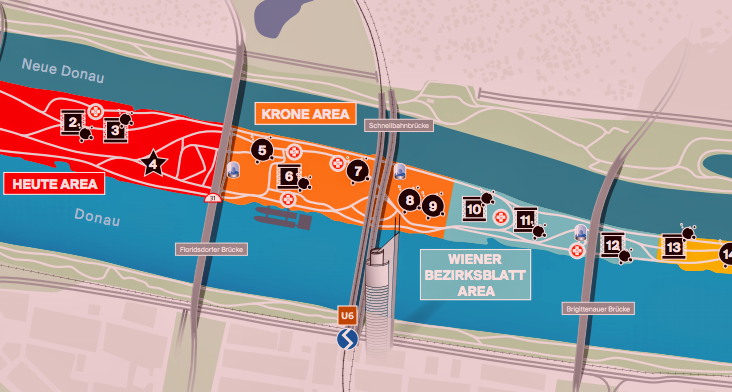 Nearby Minds needed to help Donauinselfest organizers keep a better hold on their many assets and employees while also providing value to festival-goers. The space needing coverage was huge, not to mention, exposed to the elements. How do you deploy an entire proximity system in a large space quickly and affordably? The Physical Web is gaining notoriety among event organizers, and Nearby Minds knew they could use Kontakt.io beacons to fulfill all of their client’ needs. The installation was swift and they saw almost immediate results. Even as the Nearby Minds teams flew back to headquarters, they were already seeing user interactions with their solution. Donauinselfest is known as the largest open air festival in Europe. They saw over 600 hours of programs featuring 2,000 performers in 2017. Nearby Minds used beacons to bring the Physical Web to the fairgrounds with record simplicity. Weatherproof hardware made it is easy to install the beacons outdoor, and simple reconfiguration of Kontakt.io Beacons on-site also helped expedite the process. Nearby Minds’ solution helped over 3 million fest-goers have a highly unique and memorable experience. Their nrby@ program reached users without the need of a specifically downloaded app. Festival organizers were also able to keep up with their visitors in real time, allowing them to update their messaging on the fly. Due to the 70 meter range and phone-agnostic capabilities, organizers were able to reach visitors like never before. The Physical Web allowed the developers to work without SDK integrations or worrying about app creation.